There is a lot of traffic congestion in Kampala, and ambitious plans to sort it out. This is not unusual for rapidly urbanizing cities in Africa, but in Kampala geography, politics, and land ownership complicate things. Geography makes road infrastructure and managing pollution difficult because the city is built on seven hills. A straightforward road grid is impossible. Further, Kampala is one of the most polluted cities in the world, in part because exhaust fumes collect in the valleys of the city while vehicles idle in gridlocked traffic. Uganda is one of the fastest urbanizing nations in Africa; the urban population of 1.5 million in 2013 is projected to exceed 20 million by 2040 (World Bank). Current infrastructure – and not just road infrastructure – lags far behind the needs of its steadily expanding population. Last week when I was in Kampala, the 3km journey from the central business district to the upscale residential area of Kololo took an hour in a taxi during rush hour. The Kampala Capital City Authority (KCCA) has prioritized road upgrades, widening major thoroughfares, redesigning junctions, and repairing potholes with six major projects underway or completed over the past five years. The World Bank, who is loaning Uganda US$ 212 million for infrastructural development, is supporting this. Roadwork is the main spending area for Uganda’s urban infrastructure investments. Gridlocked traffic not only results from congestion, but also from poverty. And politics. And better roads won’t solve these bigger issues. Road congestion is markedly worsened by the boda boda (motor bike) taxi system that most low income Ugandans rely upon to get around. Informal venders are also a contributing factor. The informal retail market employs over 90 percent of young workers (77% of Ugandans are under the age of 30) and some venders walk through traffic or may block roadways as well as sidewalks. The KCCA has legislated a restrictive regulatory environment to improve safety, register, and regulate boda drivers, and to remove retailers from operating along side roads and among traffic, in order to limit the negative impacts for commuters. However, many of these interventions have been overruled by President Museveni, for whom both boda drivers and street venders are important constituencies. He has stated that his weak showing in the last elections was in part because of disgruntled boda drivers, and he is trying to court their favour in the face of Uganda-wide declining political legitimacy. This summer President Museveni is threatening once again to toughen up regulations, for security reasons. An MP and his brother were gunned down outside his home by two hooded men on a motorcycle in June, not the first such case in Uganda. In response, the President has said hoodies will be banned on boda bodas and re-asserted the need for all drivers to wear helmets with a clear registration number on them. The response from Boda drivers and informal clothing venders (fearing a drop in hoodie sales) has been swift though, and few believe this ban will be enforced, but instead will go the way of the ban on plastic bags which has been weakly implemented. Politically, threatening the livelihoods of low income urban traders and boda drivers is unwise, and the current practice of threats followed by concessions is likely to continue. 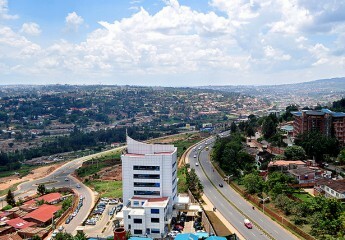 Kampala’s seven hills have also led to an unusual pattern of urban settlement. In most large African cities, a few informal settlements, or slums, have formed over time, swelling with urbanization and typically on the outskirts of town. In Kampala there are 60 distinct slums, spread throughout the city. They are in the low-lying areas, which are flood-prone and, until recently, difficult to develop. Geography has influenced this, but so to have the politics of land ownership. Kampala operates with five separate land systems: there is government land, private land, church/mosque owned land, and two types of mailo, or royal land, the Kabaka’s (King of Buganda’s) land and private mailo. All of the slums in Kampala are on mailo land. In 1900, the Buganda agreement between the British colonial rulers and the King of Buganda, the Kabaka, divided all land in this region of Uganda in two, with half under the control of the Kabaka, the other half the British. The mailo land, was then divided into two, with half going to office holders from the kingdom, others to private individuals. Mailo land cannot be transferred, it is hereditary and based on royal position. After independence from Britain, only colonial held land was transferred to the Ugandan state. This offers both protection to slum residents – the government of Uganda cannot easily displace them – but also obstacles for urban planning as any kind of development, whether a shopping mall, a railway, or slum upgrading – must be negotiated with the Kabaka, who has no official power but significant urban and traditional support and, of course, the power associated with considerable land wealth. Whether the Kabaka can genuinely be seen as a protector of the urban poor is open to debate, but he is an interesting limit on an increasingly centralized government.